Collecting all the Pokémon in a normal installment of Nintendo's beloved role-playing series is a daunting enough task for your average game reviewer. Pokémon Conquest asks them to conquer an entire continent while they do it. Man, Nintendo, cut some critics a little slack. Pokémon Conquest combines colorful cartoon creatures of joy and wonder with the non-stop excitement of unit management and turn-based tactical combat. By combining Pokémon with the Nobunaga's Ambition series of historical strategy game, Nintendo and Tecmo Koei are covering up peas with honey, tricking gamers into buying something they should play by disguising it with something they want to play. I suppose it's a better combination than Nobunaga's Ambition and Dead or Alive would have been. So how'd the campaign go, assembled video game reviewers? In case you didn't know, Pokémon happens to still be one of my favorite RPG franchises to date due to the success of the traditional titles released every year. A series that I grew up playing in middle school has seen progression over the years and improved its mechanics with each iteration. Thus, needless to say, I've just about loved every version of Pokémon since the originals. As for spin-offs, however, there's another story entirely. Typically, I've played spin-offs in the past but over the years, I've come to fret the release of a Pokémon spin-off. Sure, there are a few good titles here or there but the majority tend to lack the mass appeal that the RPGs have so embraced over the years. Nonetheless, it's amazing to me how a simple gimmick can at least lead to interest, no matter how bizarre of an idea it is. In comes Pokémon Conquest, a game that ties Pokémon with Koei's Japanese feudal war franchise, Nobunga's Ambition. And as bizarre as this combination initially sounded, the idea of a Pokémon tactics RPG whetted my appetite for some additional strategy to the typically in-depth battling system involved in the Pokémon series. Could this title overcome the strangeness of concept and provide an experience worthy of the Pokémon nametag or was it doomed to be yet another mediocre Pokémon spin-off? But if you're expecting a traditional Pokémon game beyond those aspects, you'll be sorely disappointed. The Pokémon you wield are simply tools to carry out macro and micro strategies on a gridlike battlefield. In fact, Pokémon traditionalists may well be irked by the gameplay. But if you can look past what this game isn't and focus more on what it is, you'll find a deep, well-polished, engrossing strategy offering. The bulk of the actual gameplay sees you positioning your Pokémon around a field, moving them square by square in standard strategy-game fashion and then either choosing to attack, hold your position, or use an item, which reminded me of a poor man's Fire Emblem. One downside to this, though, is that each Pokémon only has one attack move instead of the traditional four. That means that once you choose to attack, your turn with that Pokémon is all but over. For a game revolving around strategy, removing that classic Pokémon element is somewhat puzzling. That, and when-or if-a Pokémon evolves almost seems to come at random, as the leveling-up system we know and love has also been replaced by a Pokémon's "strength rating" and a meter measuring the relationship with their respective trainer. Much like the core Pokémon series, Conquest seems simpler on the outside than it truly is, and that begins with the battles. Conquest borrows the ingenious rock-paper-scissors approach to type difference from the main series and makes great use of it here. Invading the Dragon type kingdom? Better bring some Ice Pokémon with you. Much like in the main games, the hidden depth to the combat kept us engaged in battle after battle. Pokémon experts will catch on to the type differences immediately, but everyone else will learn gradually through the game's continual flow of info. We came to appreciate that complexity even if Conquest has so much to explain to players that it was hours before we finally discovered the "real" game. Continually, Conquest would reveal new aspects, from big changes like a Pokémon's special, slowly charging skill moves to little touches like taking time to feed your monstrous friends ponigiri, a cuter version of a traditional Japanese snack. Experienced strategy RPG players might believe that they'll just jump in, but even they need a few tutorials in Conquest's unique approach to the genre. Ultimately we embraced these little touches that made the already enjoyable gameplay more unique, but not everyone will be so patient. 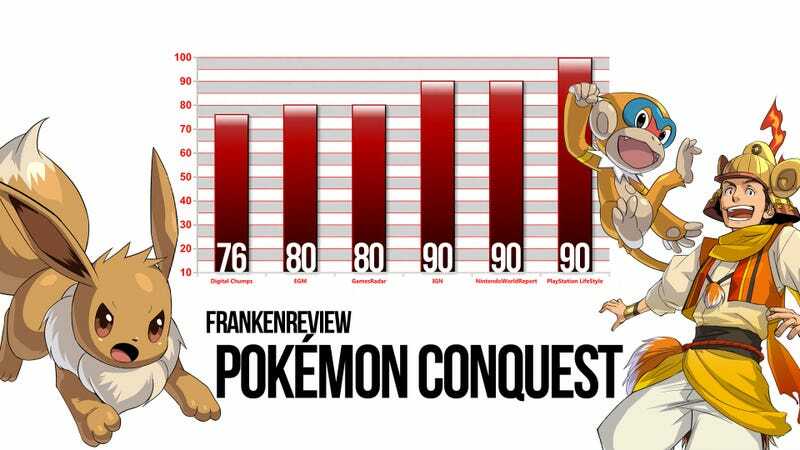 Of course, it wouldn't be a Pokémon spinoff without some sort of collecting aspect – and Conquest certainly doesn't skimp on that front. There are around 200 different monsters to link with (or "catch," in other words), as well as 200 warriors to recruit. Through linking with multiple creatures, you can assign each warrior in your army their own team of sorts (the size of the team varies for each character). While each warrior can only take one monster into battle at a time, it's useful to provide each with a varied team at their disposal since not all types work for all matches. Expanding on the concept of simply acquiring every warrior and Pokémon in the game, each of the 200 warriors is also closely linked to one of the 200 monsters. It's up to you to seek out and recruit whatever species of monster each of your warriors is meant to partner with, the one with whom they can achieve a "perfect link" (in other words, the monster they'll be able to grow the most with). In essence this means that even Pokémon that, in the original series, are almost unusable in a competitive match have the potential to become quite powerful – if you're willing to seek out their perfect link and train them to their fullest. Terribly fond of Bidoof? Just track down his warrior "soul mate" and get to training, and there's no reason he can't be one of your go-to monsters. Conquest's music is fun and appropriate to the game, and its visual style is a delight. Never before have Pokémon been drawn so beautifully in a game; it's almost a shame there are only 200 of them. Seeing them jump around on a battlefield is a nice treat, too. The main problem I had with the game is that the story only takes about 16 hours to complete. But as soon as I finished, the game informed me there were more stories to play through, adding many more hours to my experience. Even though these scenarios aren't engrossing, they're still plenty of fun to move through. Pokémon Conquest comes out at just the right time, as it looks like the perfect summer vacation game. It's portable and breezy, yet has enough depth to keep gamers interested over the long run. In addition, it looks great even compared to a number of DS games, so DS owners won't feel like they're playing a game from the previous generation. This game is a breath of fresh air for the Pokémon series, and is perfect for series fans who want to do something new and different. It's also accessible to a wide audience, from strategy newbies to all but the hardest-core tactical gamers, who may find it a bit too easy, especially at first. For everyone else, this is a must-add to any portable gaming collection. Catching all the Pokémon with military precision.